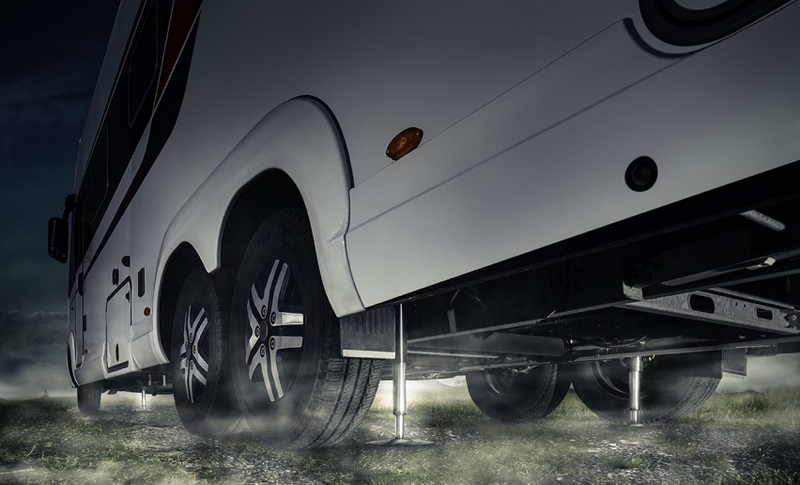 Horizontal levelling of the vehicle is quick, simple and fully automatic with our levelM hydraulic levelling system developed specially for motorhomes. The intelligent control electronics from E&P ensure that the weight of the vehicle is always distributed uniformly between several supports so that there are no torsional forces that could cause serious damage. The standard set of the levelM consists of four supports that can each lift a load of two tonnes. This lifting capacity is more than sufficient for the majority of motorhomes on the market. But even for heavyweights such as horse and racing car transporters up to 22 tonnes permitted gross weight, E&P supplies support systems that bring the vehicle into a level and steady position in a minimum of time. The system is operated as standard via a permanently installed control panel. As an option, however, levelM can also be operated with a radio remote control, touchpad or even via your own smartphone. The supports are raised and lowered via a two-way control system. The hydraulic supports can therefore be easily raised or lowered even if they are stuck in mud or frozen. All variants of the levelM have high safety reserves even at the maximum lifting weight of the hydraulic supports. For your safety, the electronics of the system are programmed so that the supports can generally only be operated when the engine is switched off. Do you have any further questions? Do you want to find out more in the form of a brochure, or do you want further advice directly? Then check us out, or drop by one of our authorised E&P installation partners near you. You can also have your levelling system installed there directly.